A hydrophobic coating sheds moisture from the outside and an inner PVC layer provide double protection to ensure your fishing tackle is protected from damage and the elements. 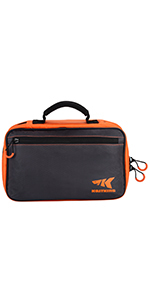 Kastking’s compression molded waterproof bottom repels standing water and the tacky material grips any surface to ensure the bag doesn’t slide. 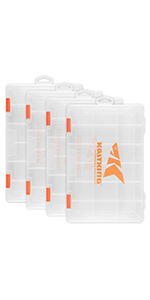 A large main section holds (12) 3700 size tackle box trays horizontally or vertiicaly(not included, but available separately from KastKing) and internal pockets store other items such as keys, wallet or phone. 12 external zippered and slip pockets provide storage for trays, terminal tackle, tools and more. External rubber coated mesh pockets can secure leader line, rain gear, pliers, or any other items for quick access. Functional design - designed for function and efficiency with the angler in mind, the double molded tool holder guarantees easy access to fishing pliers or other fishing tools without fumbling through your bag with a fish on the line. 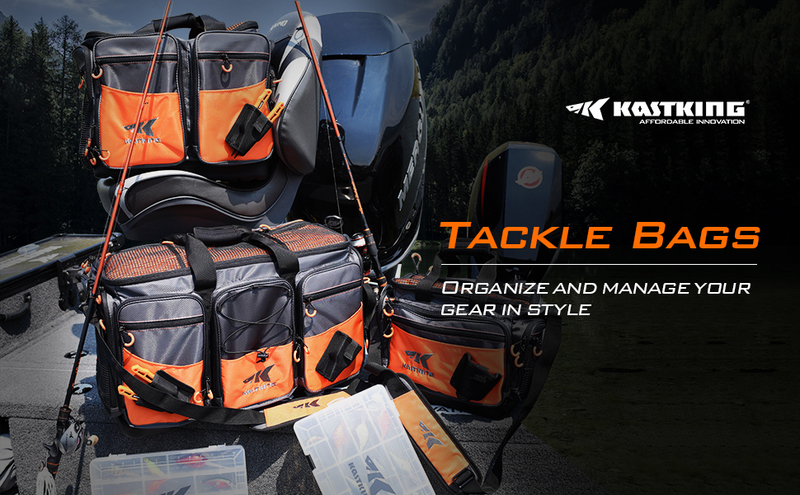 Designed with the avid angler in mind, KastKing’s soft tackle bags and tackle storage boxes make it easy to organize and manage your tackle in style. 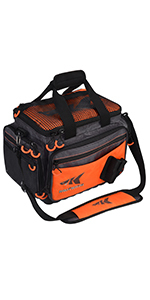 Don’t forget to load your fishing gear with KastKing’s durable 3600 and 3700 utility boxes. 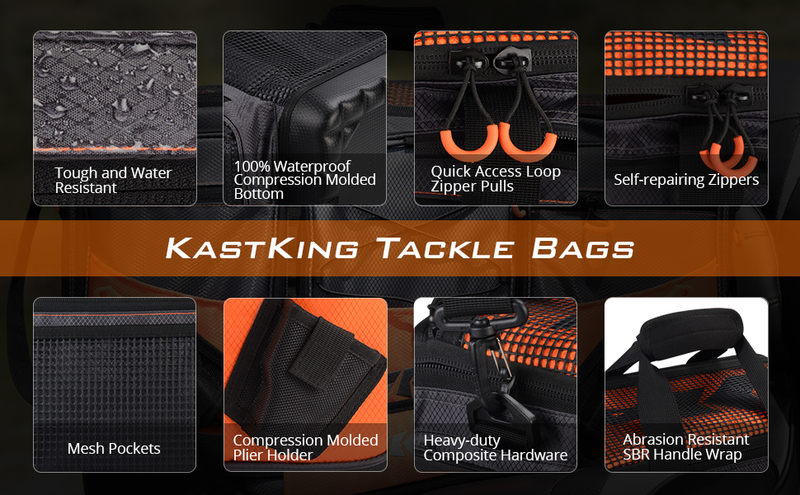 KastKing bags look great and perform even better, you will be impressed with its “Best In Class” capacity and functionality of our tackle bags. Our soft side tackle bags will quickly become your favorite and most functional bag. They also work great as a sling shoulder bag, hand bag, fishing tackle box bag, camping bag, hunting bag, hiking bag, or travel bag. 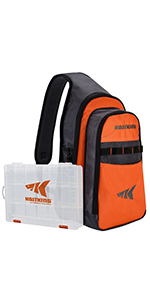 KastKing tackle bags are very tough and water resistant. Made from durable 420D rip-stop nylon, these bags are built to withstand harsh conditions. The rip-stop nylon is treated with an outer hydrophobic coating and an inner PVC layer to prevent water intrusion. Like the bottom of a hard fishing tackle box, its compression molded bottom is 100% waterproof to ensure your gear stays dry even in standing water and tacky feet grip any surface to ensure your bag isn’t sliding around inside your boat. 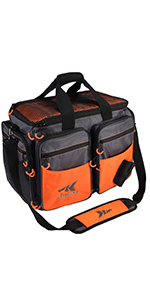 The main compartment can handle numerous tackle trays of your favorite baits and large front pockets provide additional space for utility boxes or other items. Loop zipper pulls provide quick and easy one finger access to any pocket. If you accidently split a zipper, our self-healing zippers make it easy to repair. Simply pull the zipper past the split and you are back in business. Rubber coated mesh pockets provide quick access to tools, maps or rain gear, and multiple external slip and zippered pockets make it easy to manage your fishing line spools, leader line, soft baits, terminal tackle and more. The molded tool holster and slip pockets offer quick access to the tools you need for landing that big fish and removing a fishing hook. The unique Neo-grip shoulder strap material will not slip off your shoulder. I am very happy with my bag. This is the best tackle bag I have ever purchased. I managed to fit 4 other tackle bags worth of tackle into this one bag. And still have room. Perfect! Better than I expected! This tackle bag is great, holds plenty of tackle, has many pockets for holding just about whatever, and seems to be very well built. I love how it has a place to keep pliers on the front of the bag, every time I would go fishing I always seemed to lose my pliers, but now they will always be front and center. Overall I am very pleased and I will update this review if I anything happens, but as of now I would definitely recommend this bag. Best tackle bag on the market. This Kast King tackle bag has alot of space in it. I took everything from my shimano bag put in the kast king and still had a bunch of space left. 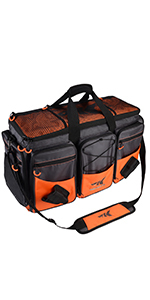 Great product I recommend this bag to anyone looking for a new tackle bag.